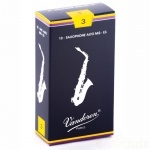 Vandoren Classic Traditional Alto Saxophone Reeds, Best buy price. delineate the limit of the area of bark. always been (and is still) used with equal success by many players. using a soft setup which gives me the flexibility I can't get in a harder setup. harder reed (med-hard Vandoren)*. People think I play effortlessly. You must ask for our advertised internet sell price when buying in store. If you do not ask, you may not receive this internet sell price.